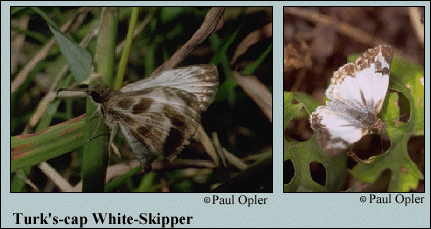 Identification: Upperside is white; forewing outer margin and apex are dark. Dark markings of female are wider and wing bases are gray. Underside hindwing of both sexes has a diffuse pattern and an olive brown band at the outer margin. Flight: Many broods from April-November in South Texas. Caterpillar Hosts: Turk\'s-cap (Malvaviscus drummondii) in the mallow family (Malvaceae). Habitat: Subtropical forest edges and openings, thorn-scrub, weedy areas, and brush. Range: South Texas south through Central America to Paraguay.